Flatness tolerance refers to the maximum deviation from a horizontal flat surface measured when the material is placed on a perfectly flat table. A ruler which does not flatten the material will give the degree of flatness. The measurement being from the highest point (or points) of the sheet or plate to the table surface minus the material thickness. Two levels of quality are available: Commercial Quality and Superior Quality. Note: If not otherwise specified, commercial quality is supplied. 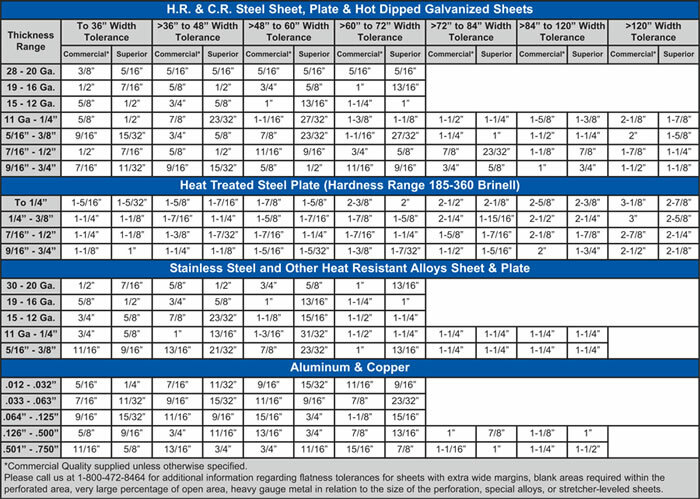 Flatness tolerances listed are of roller leveled sheets or plates with minimum or no margins. Length 10’ or less: variation should not exceed amount shown below. Length greater than 10’: variation for any 10’ of length should not exceed the amount shown. Longer dimension less than 36”: variation along the length and across the width should not exceed 1/4” in each direction. Longer dimension from 36” to 72”: variation should not exceed 75% of the amount shown for the specified width, but never less than 1/4”. Note: Margins will usually increase the maximum deviation.